We’d love your help. Let us know what’s wrong with this preview of The Fate of Rome by Kyle Harper. Here is the monumental retelling of one of the most consequential chapters of human history: the fall of the Roman Empire. The Fate of Rome is the first book to examine the catastrophic role that climate change and infectious diseases played in the collapse of Rome's power--a story of nature's triumph over human ambition. Interweaving a grand historical narrative with cutting-edge climate science and genetic discoveries, Kyle Harper traces how the fate of Rome was decided not just by emperors, soldiers, and barbarians but also by volcanic eruptions, solar cycles, climate instability, and devastating viruses and bacteria. He takes readers from Rome's pinnacle in the second century, when the empire seemed an invincible superpower, to its unraveling by the seventh century, when Rome was politically fragmented and materially depleted. Harper describes how the Romans were resilient in the face of enormous environmental stress, until the besieged empire could no longer withstand the combined challenges of a "little ice age" and recurrent outbreaks of bubonic plague. To ask other readers questions about The Fate of Rome, please sign up. The Fate of Rome is yet another investigation on the collapse of the Roman Empire. Harper knows he is not alone in this - he makes generous references to the previous literature on the topic, ranging from Gibbon and Malthus themselves to William McNeill's Plagues and Peoples. Even better, he brings in the perspective of recent archaeological and microbiological studies. Their conclusions are horrifying. The Roman Empire experienced a series of disastrous epidemics which wreaked societal and econ The Fate of Rome is yet another investigation on the collapse of the Roman Empire. Harper knows he is not alone in this - he makes generous references to the previous literature on the topic, ranging from Gibbon and Malthus themselves to William McNeill's Plagues and Peoples. Even better, he brings in the perspective of recent archaeological and microbiological studies. Their conclusions are horrifying. The Roman Empire experienced a series of disastrous epidemics which wreaked societal and economic havoc. The Antonine Plague from 165-180 (probably smallpox), then the Cyprian Plague in the 3rd century (possibly Ebola), and then the Plagues of Justinian in the 6th century, which left half of the population dead and ruined any hope of an imperial restoration. Then over three dozen more disease outbreaks over the next two centuries. For all of Rome's economic and military power, it had no way to reckon with the effects of disease outbreaks. To make matters worse, the empire also struggled with climactic changes. The period between 200 BCE and 150 CE was one of relative stability and peace - temperate, moist, and without too many major volcanic eruptions or floods. But this, too, came to an end. Sudden cold snaps which lasted for centuries drove down agricultural outputs, and the concurrent desertification of North Africa also drove down yields in the territories the empire still held. By the end of the 300s, the Eurasian steppe also experienced a period of extreme drought, leading to a mass exodus westward. These people were the Huns. And each disaster fed into the other - migrations brought with them disease, grain stores led to the feeding of rats, trade in and of itself contributed to the spread of disease. Kaplan does not supplant the old causes of Rome's decline and fall, but instead links them together. It's a more complete story. For his third book, Kyle Harper has utilised the tools developed to address the modern focus on climate change to investigate the extent to which the varied effects of environment, climate, and disease were significant in the fall of the Roman Empire. In no way does he discount the role of human agency, but compellingly argues the ways in which these factors, at varying times, pushed the empire past its resilience, beyond its ability to truly recover, and therefore played a definitive role in it For his third book, Kyle Harper has utilised the tools developed to address the modern focus on climate change to investigate the extent to which the varied effects of environment, climate, and disease were significant in the fall of the Roman Empire. In no way does he discount the role of human agency, but compellingly argues the ways in which these factors, at varying times, pushed the empire past its resilience, beyond its ability to truly recover, and therefore played a definitive role in its downfall. As Harper notes, there is a tendency to see the environment as some kind of 'stable, inert background to the story' [p. 14], a fixed stage with human actors dominating the forefront. There's no doubt that I, for one, have been wearing these blinkers and its somewhat staggering to read the far reaching impact of, particularly, these massive disease events, some of which were as devastating as the Black Death. It's not understating it to say that the book has made me reevaluate the way I look at the past; while the role of geographical factors has always played its more obvious part, now it seems clear that the connection between humanity and the environment in its widest sense should be acknowledged and evaluated. Harper goes on to discuss, in chronological fashion, the further pressures put on the Roman structure, detailing the ways in which each disease event or environmental shock had repercussions in every aspect of human life, from marriage and procreation to food production, from high politics to barbarian invasion. It is a dense history, heavy on detail and methodology, but nevertheless engagingly written. There are, of course, clear parallels in the interconnected, globalised society we live in today, and such warnings from history should be well heard. Overall, a brilliantly researched, well written, and valuable addition to the literature on Rome's fall. Kyle Harper's "The Fate of Rome" is the intellectual heir to Jared Diamond's Collapse: How Societies Choose to Fail or Succeed. Where Diamond looked at how environmental change led to the collapse of several smaller civilizations around the world, Harper argues that climate change and disease helped push one of the largest and most successful empires in history over the edge. Despite the title of this book, Harper doesn't quite argue that climate change and disease alone led to the collapse of R Kyle Harper's "The Fate of Rome" is the intellectual heir to Jared Diamond's Collapse: How Societies Choose to Fail or Succeed. Where Diamond looked at how environmental change led to the collapse of several smaller civilizations around the world, Harper argues that climate change and disease helped push one of the largest and most successful empires in history over the edge. 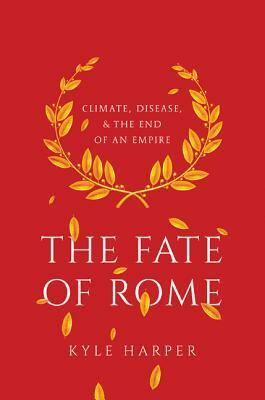 Despite the title of this book, Harper doesn't quite argue that climate change and disease alone led to the collapse of Rome in the fifth and sixth centuries. Like Diamond, he acknowledges that humans have agency and the policies of the later emperors also contributed to Rome's decline. However, Harper does show that climate change and disease sapped Rome of its resilience, which was critical to its ability to dominate the Mediterranean for hundred of years. The peak of Roman influence occurred during a warmer, wetter period in the Mediterranean (the Roman climatic optimum) that peaked during the latter half of the second century. This meant among other things that food production was more stable and inhibited the introduction of certain diseases. This also led to rapid population growth. Unlike its enemies, Rome could replenish its armies relatively quickly after defeat (the phrase "Pyrrhic victory" comes from the Punic War, when Hannibal constantly defeated Roman armies only to face new troops). During this period, Rome had a large margin for error and could afford to suffer military setbacks. With the shift in climate, food production became less reliable as areas like Egypt, which had once been the breadbasket of the empire, suddenly became too dry to grow the same crop yields. Meanwhile, several pandemics wracked the empire, including smallpox (Antonine Plague of 165), ebola (Cyprian Plague of 250), and bubonic (Justinian Plague of 541). These sapped the empire of manpower and made it much harder for the central government to recruit new soldiers for the army. The famous Hun migration from Central Asia to Europe, which pushed the Goths towards Rome, was also likely driven by climate change. The Roman state was poorly equipped to handle these environmental challenges. Roman cities were densely populated and had poor sanitation, allowing communicable diseases to spread easily. Moreover, the famous Roman transportation network allowed diseases to go from one corner of Europe to the other in short order. On top of that, Roman medical practice had no understanding of germs, so medical techniques, such as bloodletting, often made the problem worse. I have read many other books about ancient Rome and so I had heard about the various plagues and signs of climate change, but never realized just how much stress they put on the Roman state until Harper put all the pieces together. He amasses a wealth of climatological and biological evidence to show just how much the Mediterranean had changed from Augustus to Justinian. I appreciated that he took the time to explain how we know what we know about the ancient world, as well as the remaining gaps in our knowledge. Given our current concerns about climate change and pandemics, "The Fate of Rome" feels like a book just as much about the present as about the past. Harper doesn't spend too much time on the parallels, perhaps because they are so obvious. There are of course differences between our globalized world and the Roman Empire. For one thing, we have a much better scientific understanding of diseases. However, Harper's book is an important reminder that human civilization ultimately depends upon the vagaries of nature. Even more so than Jared Diamond's "Collapse," this is a dense book. Harper doesn't spend much time providing background on ancient Rome or discussing the alternative theories for Rome's fall. I highly recommend readers readers acquaint themselves with the subject before tackling this book (I'd recommend Peter Heather's Empires and Barbarians: The Fall of Rome and the Birth of Europe or Adrian Goldsworthy's How Rome Fell: Death of a Superpower). Highly recommended for readers interested in ancient Rome or environmental history. 1. While Marcus Aurelius held the reins, a pandemic “interrupted the economic and demographic expansion” of the Roman empire. 2. In the middle of the 3rd century, a cocktail of drought, plague, and political turmoil led to the unforeseen and precipitous dissolution of the empire. It was, however, determinedly rebuilt, with a new emperor, a new system of governance, and in due time a new Mythos. 3. The coherence of this new empire was splintered in the late 4th and early 5th centuries. The entire Eurasian steppe seemed to rest against the edifice of the empire's power in brand new and unsustainable ways, and the western part of it tumbled. 4. In the east, there was a resurgent Empire, but unfortunately, this was violently brought to a halt by one of the worst environmental disasters in recorded history — the double strike of bubonic plague and a little bit of ice age for good measure. Decent book. If Goodreads gave half-stars, I'd give it 3.5. But a lot of it seemed fairly basic, so I wasn't going to give it four stars. This book has a different take on Rome's fall. Instead of looking at Huns or Goths or Christians or internal politics to explain Rome's fall, author Kyle Harper looks at the environment. He starts by noting that Rome's peak came in an era called the Roman Climate Optimum, which - as the name implies - was an era where the weather really helped Rome prosper. It Decent book. If Goodreads gave half-stars, I'd give it 3.5. But a lot of it seemed fairly basic, so I wasn't going to give it four stars. This book has a different take on Rome's fall. Instead of looking at Huns or Goths or Christians or internal politics to explain Rome's fall, author Kyle Harper looks at the environment. He starts by noting that Rome's peak came in an era called the Roman Climate Optimum, which - as the name implies - was an era where the weather really helped Rome prosper. It was an era where the climate was warm, wet, and stable. So you had good weather for growing crops and maintaining a large population and a prosperous empire. From 150-450, Rome's climate became less stable, and then came the 6th century volcanic eruptions that fucked everything up. Plus disease plays a role in hurting Rome. In the glory years, volcanoes were dormant and growth ensued. Rainfall was heavier than normal. Deforestation occurred, and was consequential. By the 120s, a drought hit northern Africa, signalling the good old days were coming to an end. Plague hit Rome in 166 AD. The empire had 75 million people at the time and lots of internal trade. This went on and off through 180. The social development had created biological diversity. Pathogens were likely increased by the urbanization. Deaths, even before the plague, tended to spike in August and September, indicating stomach/intestinal diseases. Malaria, TB, and lepracy were all common. The big plague led to an increase in religious devotion centered on Apollo. He was a big deal before, but never like this. The best guess is that the plague was smallpox. People have estimated it killed from 2% to 33% (!!) of the people: from 1.5 to 25 million. Silver mining collapsed, prices skyrocketed and rent prices went down. Best guess here: 10-20% died. The Roman Climate Optimum gave way to the Late Roman Transition by the late 2nd century. By the later part of the century, drought hit the Mediterranean, especially in the south and east. The Nile had some weak flows. A plague came up from Ethiopia by the 250s. A 2nd wave came the next decade. It was maybe influenza and Harper even floats the possibility of ebola. (Uh, the first known case of ebola in humans is in the 1960s, so color me skeptical). Around this time the empire really started to fragment, but it rallied. There was also persecution of Christians around this time. Aridity along the Eurasian steppe led to the migration of groups like the Huns. Eventually the climate stabilized as the population went up in France and Germany. But central Asia stayed dry and the Huns moved into Europe outright. Rome fell. In the late Roman/early Byzantine world, rats came and brought a new plague during the time of Justinian. There had been a revival of Eurasian trade. 536 was the year without a summer. Plague hit and social order collapses. Maybe half the population died (!!!). More outbreaks came. From 542-619, it came once every 15 years. It came two more times by the mid-8th century. Pope Gregory the Great responded to the plague with a ritual parade of mournful prayer. The 530s kicked off a 150-year cold snap: the Late Antique Little Ice Age. The Byzantine Empire was sapped of its vitality. Italy had population collapse. The west was hurt harder than the eastern Mediterranean. Justinian held on due to ruthlessness. (The way he handled the Nika riots helped ensure no one rioted here when his empire still demanded the old tax rates). Future emperors had to lessen tax intake, though. Christianity responded by putting more focus than ever before on Mary. Apocolyptic writing was more common among Christians and Jews. But it all helped set the stage for Islam. A different perspective on the fate of Rome. What made the empire to topple? Adrian Goldswhorty gave us in 2009 his thesis that It was the internecine fights what ended the system in "How Rome Fell" and now I have my hands in this jewel of a book telling me that germs and climate change are the new culprits. Fascinating read and a pleasure to witness a task force from different fields of science to take on this wonderful tale of how good luck on climate cannot last forever. On the other hand this A different perspective on the fate of Rome. What made the empire to topple? Adrian Goldswhorty gave us in 2009 his thesis that It was the internecine fights what ended the system in "How Rome Fell" and now I have my hands in this jewel of a book telling me that germs and climate change are the new culprits. Another decline and fall theory for the perennial pastime of expounding on what did in the Romans. This book pins the blame on climate change and disease. These games are fun like trying to look at stills of the grassy knoll it can only go so far before becoming guesswork and speculation but fun to entertain the ideas especially if you are Roman Empire buff. This is a fascinating book on a topic that I assumed had long since been picked over. There was quite a bit of evidence to support the author's arguments. It does enjoy using a 75 cent words when a 10 cent one might do the job. Kyle Harper's The Fate of Rome is so far the best and most thought-provoking investigation into the role of climate in the end of the classical world. You can already tell something from the previous line of telling: not the generic "Fall of the Roman Empire", but "end of the classical world" -- that's right. Whereas the deposition of Romulus Augustulus in 476 AD might strike a contemporary college student as the year of Rome's demise, nobody at the time of its happening actually thought of that. Kyle Harper's The Fate of Rome is so far the best and most thought-provoking investigation into the role of climate in the end of the classical world. You can already tell something from the previous line of telling: not the generic "Fall of the Roman Empire", but "end of the classical world" -- that's right. Whereas the deposition of Romulus Augustulus in 476 AD might strike a contemporary college student as the year of Rome's demise, nobody at the time of its happening actually thought of that. In fact, the year 476 AD itself was a later recognition dated back to almost 50 years later. The gist here is: the classical/Roman world characterized by its distinctive way of living and organizing political and economic activities did not immediately fall apart upon the eviction of the last (Western) Roman emperor, instead that came almost 70 years later, in the midst of the 6th century, marked by a series of devastating natural disasters, famines, wars, and epidemics that fundamentally changed the face of the Mediterranean world. How did that happen? One with knowledge of that period would most likely point to Justinian I, who plunged the eastern half of the empire into a chronic war against the barbarians in the name of reconquest, which ended up severely weakening the empire; and while this was happening, a series of unfortunate catastrophes swept across Justinian's empire and waged irreparable damages that not only killed the last hope of revival but also foreshadowed the oncoming downfall of the 7th century. That was the typical political narrative that most of us were taught in school. Although there's nothing inherently wrong about such narrative, it does present us with a somehow incomplete view of what actually happened in that short span of 5o to 70 years; moreover, by stressing out political and military events while depicting natural disasters and epidemics as sideshows, it misses important parts of the picture. Through Harper's telling account of the historical evolution of Mediterranean climatic pattern, we get to know that despite what most people believed, natural factors did play a significant role in shaping the political landscape of civilizations. For instance, the period commonly known as "Pax Romana", which marked the high point of the Roman Empire, coincided with what climatologists called the Roman Climatic Optimum, a period characterized by unusually warmer and more stable climate throughout the Mediterranean basin and most parts of Europe. The beginning of Rome's political turmoils and military setbacks coincided with several destructive waves of epidemics as well as unpredictable changes in climate. Perhaps it shouldn't come as such a big surprise that the most chaotic years of the Crisis of the Third Century was also accompanied by the devastating Plague of Cyprian. It was only in the midst of the 6th century that the severity of these fluctuating natural factors finally reached its climax, culminating in the cataclysmic events of late 530s and 540s. By 550 AD, those who managed to survive all the terrible disasters suddenly found themselves living in a completely different world: the population was much less, cities and towns were mostly abandoned or destroyed, trans-regional trading networks came to an end, the classical Roman system that revolved around urbanism and market economy was gone. Notice that this isn't to present an alternative, or worse, a revisionist narrative to the traditional political narrative we are familiar with. Instead, the message Harper was trying to convey was simple: those major political events on the surface were more or less propelled by natural factors from a long-term point of view -- the Pax Romana couldn't happen without a warm and stable climate that contributed to increased crop yields, more available arable lands, and less risks from unpredictable weathers and natural disasters. Agriculture surrounding the Nile River, for example, relied heavily on the river's natural cycle of flooding; considering Rome's dependency on Egypt for its often excessive grains, it isn't difficult to understand why the Empire was in chaos whenever the steady supply of Egyptian grains was disrupted, either by natural phenomenon or human machinations. Obviously emperors, generals and bishops all played major parts in shaping the Romand world, but it shouldn't be overlooked that their actions were almost always influenced by external factors beyond their control. Some may point the aforementioned to environmental determinism -- Harper certainly didn't endorse the determinist position, and it's important to understand why: although climatic patterns and other natural phenomena did correlate with our social and political timelines, such correlation did not imply any certainty of causal relations. Environmental determinism holds the view that all historical events were predetermined by its surrounding environment, hence implying definite causes and effects, yet causal relations cannot be established based on pure correlations, let alone imperfect ones (there were plenty of counterexamples; Rome itself was a good one -- whereas it eventually succumbed to changing climate and epidemics, what's surprising was that it survived anther two and a half centuries following the Crisis the Third Century, which, by any measures could easily be the end of the Roman Empire. Thus comes to the conclusion -- did natural disasters and epidemics caused the collapse of the classical Roman world? No, but they certainly contributed greatly to the process. The only difference between Rome in the year 260 AD and the year 540 AD was the level of resilience -- Rome under capable Illyrian emperors was amazingly resilient against challenges, while Rome under incompetent child emperors gradually lost that string of resilience that bonded the empire together. In short, it wasn't a surprise that Justinian's empire crumbled in the face of unprecedented disasters, the real surprise was that the empire didn't fall apart as early as the second half of the third century. Saying that nature caused civilizations to fall was misleading, for every civilization has its own limit of resilience; what ultimately determines the fate of a civilization wasn't the severity of its environmental challenges, but the level of resilience that supported its complex systems. I thought this was a very interesting take on the end of the Roman Empire. Harper argues that plagues, brought on by expansion and sedentary society mixed with climate contributed the demise of the Empire. This book places disease and climate at the center of the fall of the Roman Empire. It's probably best read in conjunction with other books of the fall of Rome- its political and military narrative is not especially detailed, but as Harper points out, many books already exist that cover those dimensions. This is a good, sweeping view of new information, told in fairly accessible (though often very purple) prose. I found the disease chapters to be especially masterful, and will probably assign the This book places disease and climate at the center of the fall of the Roman Empire. It's probably best read in conjunction with other books of the fall of Rome- its political and military narrative is not especially detailed, but as Harper points out, many books already exist that cover those dimensions. This is a good, sweeping view of new information, told in fairly accessible (though often very purple) prose. I found the disease chapters to be especially masterful, and will probably assign them in future classes. Harper gives a compelling picture of the ordinary disease regimen of the Roman Empire, which already took a toll on its population (the discussion of the diminutive height of Romans as resulting from disease rather than malnourishment was new to me, and fascinating), and then does an equally masterful job in showing why pandemics were different. He gives the Antonine plague and the plague of Cyprian their due importance, which I don't think has been done in quite this way before. The bubonic plague of the sixth century and beyond is described with queasy relish, and its economic, social, and political effects well argued. I found the climate chapters less compelling, but this is partly because climate data itself is so complicated. Harper does his best, but the effects of many changes were variable and localized, and sometimes he gets lost in details and hypotheticals. He is on the strongest ground (and writes the best) about big and dramatic changes: volcanic eruptions, the Late Antique Little Ice Age. In general, it seems clearer and clearer that climate played a role, but many details of that role remain to be further clarified. My main critique of the book involves its treatment of the archaeological evidence for the early empire. Here again Harper is somewhat at the mercy of the data: archaeological evidence is also messy and fragmented. Even so, not enough attention is paid to regional variation. Harper presents a relentlessly sunny view of life up to the mid-second century, insisting on universal agricultural prosperity and economic growth. But our evidence and proxies are heavily biased towards Italy, and contingent in various ways (Harper cites, but dismisses, Walter Scheidel's critique along these lines), and we know there were regional variations and areas that stagnated in the empire. Harper critiques building as a proxy of growth in the late empire, but embraces it in the early empire. He discusses slavery for the late empire, but largely ignores it in the early empire. He gives regional variation its due for the later empire, but not for the earlier (this may be partly because we have so many broad, good syntheses for the late empire, like Chris Wickham's "Framing the Early Middle Ages.") In general, his footing is simply much surer for later centuries, which makes the first two chapters read as too sweeping and shallow. We might as well have had no new information since Gibbon. Instead of rehearsing the unraveling of late Roman antiquity as a monochromatic and monotonous tale, what would happen if other disciplines were drawn on and brought to bear? How would it change our history of the fall of Rome if we could tease out many of the environmental and biological conditions of the time? Kyle Harper, Professor of Classics and Letters and Senior Vice President and Provost at the University of Oklahoma, has made just such a venture in his new 440 page hardcover “The Fate o Instead of rehearsing the unraveling of late Roman antiquity as a monochromatic and monotonous tale, what would happen if other disciplines were drawn on and brought to bear? How would it change our history of the fall of Rome if we could tease out many of the environmental and biological conditions of the time? Kyle Harper, Professor of Classics and Letters and Senior Vice President and Provost at the University of Oklahoma, has made just such a venture in his new 440 page hardcover “The Fate of Rome: Climate, Disease, and the End of an Empire”. Between the covers of this portfolio Harper recounts the mid-second century until the mid-seventh century, hauling in other aspects of human and non-human records, to give a more interwoven, intriguing and insightful account. Professional historians, amateurs and those who simply want to be informed will find the volume readable and intelligible. “The Fate of Rome” is something like a busy biker bar where all of the “Logy Gangs” gather to strut and sport their dominance: anthropology, epidemiology, climatology, sociology, biology, speleology, dendrology, archeology, volcanology, and ecology. Each gang has something to say and supply to the story! And in the end, what they add to Rome’s narrative is alarming; “the fall of their empire was a triumph of nature over human ambitions. The fate of Rome was played out by emperors and barbarians, senators and generals, soldiers and slaves. But it was equally decided by bacteria and viruses, volcanoes and solar cycles” (4-5). Harper recaps later Roman antiquity, primarily focusing on the three major mortality events: AD 165, 249 and 541. He not only maps out the human actions and decisions, but melds in the climatological changes that were happening at these times, as well as the microbial cocktails that reached explosive levels, from which it becomes clear that the “great killers of the Roman Empire were spawns of nature” (18). This brings the author to conclude that “human societies are dependent upon their ecological foundations” (288). “The Fate of Rome” is a gripping chronicle of the fall of an empire with new colors added to the canvass that draw out freshly defined shadows and highlights. The finished product is a fuller picture packed with human resolve and resilience in the midst of crushing catastrophes. Not only does “The Fate of Rome” fill in many blank areas in our perceptions of Rome, but it gives us historical reasons to humbly pause and reflect on the fragility of human and social existence. Academics and aspirants alike will find this dossier enlightening. Harper’s writing style makes it easy to read and retain. If you’re looking for one volume to acquire and read on Roman history; or if you’re pondering how ecology, climatology and biology might affect human societies, this is the book you need to rush out and get! I heartily recommend the book. A narrative history of Imperial Rome that focuses primarily on the history of climate change and disease. It surveys a wealth of recent work understanding climate change and the evolution of pathogens. It's striking to note the way this recent scientific work aligns with the written record: In early Imperial times the Tiber flooded in the spring and high summer (48). Late in Justinian's reign the Danube froze "as usual... to a considerable depth" (271). Climate is not constant-- "on its own term A narrative history of Imperial Rome that focuses primarily on the history of climate change and disease. It surveys a wealth of recent work understanding climate change and the evolution of pathogens. It's striking to note the way this recent scientific work aligns with the written record: In early Imperial times the Tiber flooded in the spring and high summer (48). Late in Justinian's reign the Danube froze "as usual... to a considerable depth" (271). Climate is not constant-- "on its own terms and tempo, nature alters the conditions within which human societies have sought to scratch out their livelihoods" (290). The history of disease seems like it should be less surprising. We know that pre-modern medical practices did more harm than good, and we know that many more people died of disease in the past. The surprise here is how profound the impact of disease was, and how little this impact is discussed in history of the period. The Antonine Plague (c. 170 AD) was likely a smallpox epidemic that killed more than 10% of the population. The later plague, definitely an outbreak of of Y. pestis, began in AD 541 and continued at irregular intervals until AD 749 (236). The initial outbreak in Constantinople killed 300,000 according to the estimates of John of Ephesus. The total population had been half a million. The death rate, then, was probably the same as the 50-60% estimated for the Black Death. Concurrent with the plague, the Roman world faced the Late Antique Little Ice Age and the Year without Summer in AD 536, the latter caused by a volcanic eruption and followed in 539 or 540 by a second explosion that blocked the sun and left traces at both poles (253). The bad: it reads like a scientific book about scientific events that happen to take place during the Roman era versus an actual book about the Roman era. Not necessarily a bad thing, but sometimes I thought there were too many mentions of climate, pests, earthquakes and other natural phenomena and not enough actual history. The good: the flip side of the above. It's a different and interesting take on the story of the Roman empire, from a scientific point of view. One of the most impressive and intellectually generous works of scholarship I’ve read. I didn’t know I was capable of enjoying climatology and epidemiology quite so much. Kyle Harper provides a thorough examination of the unseen forces in the collapse of the Roman Empire in Late Antiquity, namely disease and climate change. Harper’s central thesis is that the environment, in which the political and social events leading to the downfall of the ancient world occurred, was not merely a static backdrop. Rather, environmental factors had their own influence in the ups and downs of antiquity. This book masterfully synthesizes an exceptionally broad range of sources fro Kyle Harper provides a thorough examination of the unseen forces in the collapse of the Roman Empire in Late Antiquity, namely disease and climate change. Harper’s central thesis is that the environment, in which the political and social events leading to the downfall of the ancient world occurred, was not merely a static backdrop. Rather, environmental factors had their own influence in the ups and downs of antiquity. This book masterfully synthesizes an exceptionally broad range of sources from textual and archaeological evidence to scholarly work by both historians and scientists. Harper constructs this in a loosely chronological format from the Antonine dynasty to the rise of Islam. He alternates thematically between focusing on disease and climate, but ultimately highlights how the two factors are not completely independent and do influence each other. For disease, Harper helpfully provides a detailed summation of the health hazards faced in the ancient world. From severe malnutrition to poor hygiene to malaria, the ancient world, even in prosperous times, was no role model for a healthy society. This is perhaps best shown in the osteoarcheological evidence that reveals significantly stunted growth. An overview of cures, either religiously based or more medical remedies, as exemplified by Galen, further serves as an insight on how disease was thought of. This information then serves as a background for three pandemics that devastated the ancient Mediterranean. The Antonine Plague (smallpox) in 165 AD, the Plague of Cyprian (either influenza or a hemorrhagic fever) from 249-262 AD, and the Justinianic Plague (pneumonic/bubonic plague) from 541- 749 AD each had a unique impact on Mediterranean society. They levied tremendous stress on the government to provide aid and led to religious fervor as fearful individuals flocked to deities like Apollo or the Christian God for relief. Disease certainly had its place in the chaotic last centuries of the Roman Empire alongside the multitude of invasions and economic woes. The other more subtle and less dramatic, though still a crucial factor, was the changing climate. Harper utilizes a vast range of scientific studies and data (ice core samples and dendrochronology, for instance) to show how the environment of the ancient world was gradually changing over the course of several centuries. The high point of the Roman Empire coincided with the climatological period now deemed the Roman Climate Optimum (200 BC – 150 AD). This was a particularly warm and moist period for the Mediterranean climate. The chief benefit for ancient societies was longer agricultural seasons and a climate that made more lands farmable. However, this period did not last forever. The Mediterranean climate began to shift towards colder and drier patterns in the Late Roman Transitional Period (150 AD – 450 AD) and eventually The Late Antique Ice Age (450 AD – 700 AD). These changes lead to more crop failures and famine, which was especially problematic for the now populous Mediterranean. Besides the obvious deaths from starvation, these incidents led to more political and economic instability. A period of high volcanic activity in the 530s AD probably only accelerated this change by spewing ash into the atmosphere. It’s little wonder than that these changes, along with the devastating Justinianic Plague, created a widespread apocalyptic sentiment in the 6th and 7th centuries AD. For many, this was believed to literally be the end of days. Harper’s book is a tremendously valuable addition to modern scholarship. He convincingly argues that human and environmental events are not so easily separated. The work of the historian and the scientist are not so detached from each other. Rather, there is a powerful utility in placing these disciplines alongside each other. Furthermore, this book will hopefully further dispel the popular perception that there was a singular cause of the fall of the Roman Empire. Disease and climate are only two of the myriad factors such as political, sociological, and economic trends that must be considered when tackling that question. Overall, this book is an excellent read for anyone interested in antiquity. I suspect that those with an interest in climate science or epidemiology would enjoy it as well. Highly recommended for anyone with an interest in the history of the Roman Empire. The author explores an aspect of the fall of the empire that most histories don't really touch on, the effects of climate and disease. The rise of Rome and the empire coincided with a climate regime called, appropriately enough, the Roman Climate Optimum, from about 250 BC to 400 AD. The climate in the Mediterranean during this period was warm and moist, excellent for the agriculture that underpinned the empire. I Highly recommended for anyone with an interest in the history of the Roman Empire. The author explores an aspect of the fall of the empire that most histories don't really touch on, the effects of climate and disease. The rise of Rome and the empire coincided with a climate regime called, appropriately enough, the Roman Climate Optimum, from about 250 BC to 400 AD. The climate in the Mediterranean during this period was warm and moist, excellent for the agriculture that underpinned the empire. In the 400's the climate began the shift to the Late Antique Ice Age, with colder weather and in many areas a drier climate, reducing agriculture output and disrupting climate sensitive crops, like olives. In addition to the climatic changes the Empire suffered three series of plagues that killed large portions of the population. The Empire had created a complex transportation network using sea, river and roads. Roman traders had gone down the Red Sea and east to India and Southeast Asia. When plagues arose this network, and the lack of knowledge of microorganisms and diseases, allowed epidemics to spread throughout the Empire. First there was the Antonine plague in the 160's AD. What it was is uncertain, but descriptions of the symptoms suggest a form of small pox. Then the Plague of Cyprian came in the mid-200's. Also unidentified, it appears to have come down the Nile valley and spread to the rest of the empire from there. It might have been a form of ebola. Then the Justinianic plague began in the mid-500's, effectively undercutting the successes the Emperor Justinian had had in restoring the empire. Dna evidence from archeological sites has shown this it was a strain of bubonic plague that arose in Asia and was probably carried west by traders. The disease bacteria found hosts in rodents in the west and outbreaks continued at intervals until the mid-700's, when it mysteriously disappeared. A new strain of bubonic plague would come out of Asia in the 14th century to cause the Black Death. A really interesting analysis of the fall of the Roman Empire from the perspective of climate and biological factors. Up until this point I thought that the Roman Empire fell because, you know, civilizations become decadent and corrupt or whatever as they become successful. The imperial system was brittle, the army was expensive and impossible to control, palace intrigue, etc etc. But when you look at it from the perspective of climate and disease, it's kind of hard to see how even the world's mo A really interesting analysis of the fall of the Roman Empire from the perspective of climate and biological factors. Up until this point I thought that the Roman Empire fell because, you know, civilizations become decadent and corrupt or whatever as they become successful. The imperial system was brittle, the army was expensive and impossible to control, palace intrigue, etc etc. But when you look at it from the perspective of climate and disease, it's kind of hard to see how even the world's most brilliant and enlightened leaders could have pulled the Roman Empire through the years 260-640AD. Those years were just a terrible, awful time. First, in 260AD the Cyprian Plague (possibly smallpox, a Spanish flu-like influenza, or an Ebola-like virus) swept through the empire. A significant portion of the population died. In addition, this time period experienced climatic flux, causing bad harvests. These two factors caused financial collapse - the empire had to debase the silver currency, causing Zimbabwe-like inflation. As Harper points out, the social and financial collapse ended many ancient institutions and endowments throughout the empire and struck probably a fatal blow to the old pagan beliefs. Barbarians from the north were able to invade the empire, triggering a takeover of the throne from the ancient senatorial elite by the 'barracks emperors' - military officers from the Danubian regions. These emperors rarely stayed in Rome, instead living in military towns along the Northern frontier until Constantine established Constantinople ~300AD. When looked at from this point of view, the crises of the 2nd half of the 3rd century were not caused by imperial decay - they were causing by a freaking massive plague and famine. Harper mentions a number of 3rd century emperors who seemed to be capable in good times and bad - from Septimius Severus (before the plague) to Claudius II (the first barracks emperor) to Diocletian and Constantine. The empire didn't lack for emperors who were at least as capable as the emperors of Rome's Golden Age. Moreover, the empire proved somewhat resilient in the face of plague, famine, financial collapse, and invasion (at least in that it was able to survive). The 4th century brought a bit of a respite from plague and environmental change, but by the end of the century a massive drought in Central Asia spelled Rome's doom. The drought probably caused the hordes of Central Asia to turn their attention from East Asia towards Europe, and the Huns migrated into Eastern Europe. They pushed the Gothic kingdoms to cross into Roman lands. For the first time, the Romans proved unable to expel the invaders and instead let them settle their lands and join their army. The Romans mistreated the Goths and eventually they revolted, defeating the Romans and killing the Emperor Valens at the Battle of Adrianople in 378 AD. In 410, they sacked Rome. From this point, the Western Empire entered a death spiral and ended in 476 AD. The Eastern Empire, however, was able to recover. According to Harper, Greece and the Levant, in particular, experienced strong recoveries. In the first half of his reign, from 527-541, Justinian reconquered North Africa and Italy, codified Roman law, and built monumental public works such as the Hagia Sofia. I think this shows clearly that without climate and disease factors, the Roman empire was NOT doomed to failure. Talented rulers such as Justinian could probably have restored the empire to at least an approximation of its former power. But in 541, bubonic plague struck the empire for the first time ever. The plague was probably just as devastating as the Black Death in terms of relative population loss. Entire regions of the empire, and many of its greatest cities, were completely depopulated. Italy and central Anatolia, among other regions, were sent back to Iron Age levels of population and civilization. On top of that, the two decades following the plague were the coldest of the past 2000 years, partly because of the sun's cycles and partly because of volcanic activity - the year 536 was known as "the year without summer" because volcanic emissions masked the sun for 18 months. And that was just the kick-off to a 200-year climate regime known as the Late Antique Little Ice Age. On top of that, the plague didn't just hit once and disappear. It continued to ricochet around the empire, devastating and redevastating cities and countryside, for 200 years. On top of that, Rome and Persia entered a period of 'total war', in which both sides suffered severe losses, and the Levant was devastated. Avars and Slavs invaded the depopulated Balkans. The final death blow to the empire came with the eruption of Islam onto the scene. I imagine that the Arab armies had no trouble conquering the withered husk of Rome's North African and Levantine territories. Harper calls the Islamic conquests of the 630-640s the 'end' of the Roman Empire, because after that 'Rome' was reduced to a doomed rump of its former self, since it had lost all of its important territories and was crippled by plague. I think this book has some really important lessons. First of all, it really undercuts the idea that states rise on the backs of industrious, moral people and that they fall as the people become decadent and corrupt. Although there is still obviously room for human agency in determining history, things that are completely out of our control, especially the climate and disease, are at least as influential, if not more so. The period between the Cyprian Plague of 260AD to the fall of the empire in the 630s was really, as the author styles it, the 'end of the world.' The Roman social order had existed for well over a thousand years by that point. For the vast majority of that time, it was impossible for people to imagine that that order could ever end, much as we feel about our own society today. It's fascinating to see what it takes to end a thousand-year-old order - devastating plagues and famine caused financial collapse, gave fuel to new apocalyptic religions, and enabled invaders to migrate into the empire. To the people of the late empire, observing unimaginably lethal new diseases, once-prosperous cities turned to desert, once-dry cities swept away by floods, once-warm rivers freezing in the winter, and barbarians sacking city after city, it must have really felt like the end of the world. The growing field of exploring history via the climatological record is long overdue. Too long have subjects like The Roman Empire been explained and studied through the lens of Awesome Men Doing Awesome Things Because Awesome. While that does play a part, it's only logical that the ground on which they stood and the air they breathed and the climate that surrounded them played a part as well - perhaps the biggest role of all, in the case of the Roman Empire. It's the story of a society that was The growing field of exploring history via the climatological record is long overdue. Too long have subjects like The Roman Empire been explained and studied through the lens of Awesome Men Doing Awesome Things Because Awesome. While that does play a part, it's only logical that the ground on which they stood and the air they breathed and the climate that surrounded them played a part as well - perhaps the biggest role of all, in the case of the Roman Empire. It's the story of a society that was extremely lucky and in the right location at the right time, and didn't know how good they had it until Nature swung the other way. There was so much fascinating info that Harper wove into his narrative of the centuries-long "Roman Climate Optimum" and the inevitable slow decline of the climate trend to recount here. But there were some things that have stuck in my mind, namely that there are olive press ruins way up on hillsides, far above where olives are currently cultivated. Would workers have toted their product all the way up the hill to process it? Doubtful. If you're interested in how weather (in the short term) and climate (in the long term) affected societies pre-Industrialization, this is a worthy read. It has given me much food for thought in how I view Rome's rise and fall. As an aside, I found Harper's narrative of climate's effect on the political and social order of an extensive geographical region far more deftly composed than Geoffrey Parker's Global Crisis: War, Climate Change and Catastrophe in the Seventeenth Century, which was overlong, repetitive, and had indifferent vision and focus. Same themes (though different epochs), but the execution is like night and day. If only Parker had been as precise an author as Harper. I enjoyed reading Harper's book; he is a good writer and quite eloquent. He does a good job of explaining some of the more complicated issues regarding climatology and epidemiology. Most of us are probably more familiar with the frame of time from the end of the Roman Republic to the beginning of the Empire, the Augustan Age. Both the earlier and the later periods are more unfamiliar. Harper concentrates on the times when the Empire was hit by major plagues from the middle of the second and thir I enjoyed reading Harper's book; he is a good writer and quite eloquent. He does a good job of explaining some of the more complicated issues regarding climatology and epidemiology. Most of us are probably more familiar with the frame of time from the end of the Roman Republic to the beginning of the Empire, the Augustan Age. Both the earlier and the later periods are more unfamiliar. Harper concentrates on the times when the Empire was hit by major plagues from the middle of the second and third centuries until the plagues that hit Byzantium in the sixth through the eighth centuries following the fall of the Western empire. We also assume, I think, that the drama of Roman history took place against a static background in regards to both climate and disease. Again, we tend to use the Augustan period and the first century as our template, a time that was most favorable in regards to the climate and lack of disease. That halcyon period was not to last. The Empire received body blows starting with the Antonine Plague of 167; then the Cyprian Plague a hundred years later. After the fall of the West, Byzantium endured the Justinian Plague from its inception in the sixth century through outbreaks lasting until the eighth century. During the same time, there are drastic changes in the weather causing food shortages and famine. Not only does the weather affect crops, but there is an inter-relationship between weather conditions and the spread of disease vectors. I really wanted to like this book. I heard the author speak, presumably part of a book tour, and his speech/presentation was very interesting and enlightening, so I bought the book. I was disappointed. First, I think you have to have a decent knowledge of Roman history going into this book to follow it, and I don't. He makes lots of references to people, groups of people, and places I have never heard of. He does have some maps in the book, which is helpful. However, there are certain cities of I really wanted to like this book. I heard the author speak, presumably part of a book tour, and his speech/presentation was very interesting and enlightening, so I bought the book. I was disappointed. First, I think you have to have a decent knowledge of Roman history going into this book to follow it, and I don't. He makes lots of references to people, groups of people, and places I have never heard of. He does have some maps in the book, which is helpful. However, there are certain cities of ancient groups of people I didn't know existed, that play a rather important role, so I was lost every time he would refer to them. (Who are these people and where do they come from? I would have enjoyed learning of them if he had given at least a little background on them instead of just a name.) Second, Perhaps this wouldn't have been so much of an issue if I already had knowledge of these ancient rulers, groups of people, and places, but he jumps around a lot both geographically and chronologically. Some of the chronological jumping is to explain why something is important or to give you knowledge the people back then didn't have, but it only confused me more. Perhaps if the book had been organized better or there had been more labeled subsections, it would have helped. Even though the final centuries of the Western Roman Empire have been studied by lot of authors, from several perspectives (internal politics, secondary state formation, macroeconomics), this book contributes with new insights on climate change and epidemiology. In this case, the final years of Western and Eastern Roman Empires arise as the result of complex interactions between environmental and human factors. The end of a warm climate period (Late Roman Optimum) and the Antonin plague (probably Even though the final centuries of the Western Roman Empire have been studied by lot of authors, from several perspectives (internal politics, secondary state formation, macroeconomics), this book contributes with new insights on climate change and epidemiology. In this case, the final years of Western and Eastern Roman Empires arise as the result of complex interactions between environmental and human factors. The end of a warm climate period (Late Roman Optimum) and the Antonin plague (probably smallpox), along with political aspects, contributed to the third century crisis. The partial resurgence of the Roman Empire later and the sixth century boom of the Eastern one were helped by better climate again. Finally, the Justinian plague (certainly bubonic plague), along with another climate cooling and political, economical and religious factors dealt a hammer blow to the Eastern Empire, that lost irreversibly most of its territories and its power. I’ve seen some complaints this book is boring, but I disagree. It’s academic and I have some issues with its structure (i.e., building up to the plague of Justinian and then hardly covering it compared to other epidemics). But it’s a fantastic book. It’s engaging and replete with maps and tables of data, which help detail it’s arguments. It’s compelling and engaging and well worth the read. Professor of Classics and Letters and Senior Vice President and Provost at the University of Oklahoma. His research topics are the social and economic history of the Roman Empire and the early middle ages, and the environmental and population history of the first millennium, exploring the impact of climate change and disease on the history of civilization. from http://www.ou.edu/flourish/about/team Professor of Classics and Letters and Senior Vice President and Provost at the University of Oklahoma. His research topics are the social and economic history of the Roman Empire and the early middle ages, and the environmental and population history of the first millennium, exploring the impact of climate change and disease on the history of civilization.